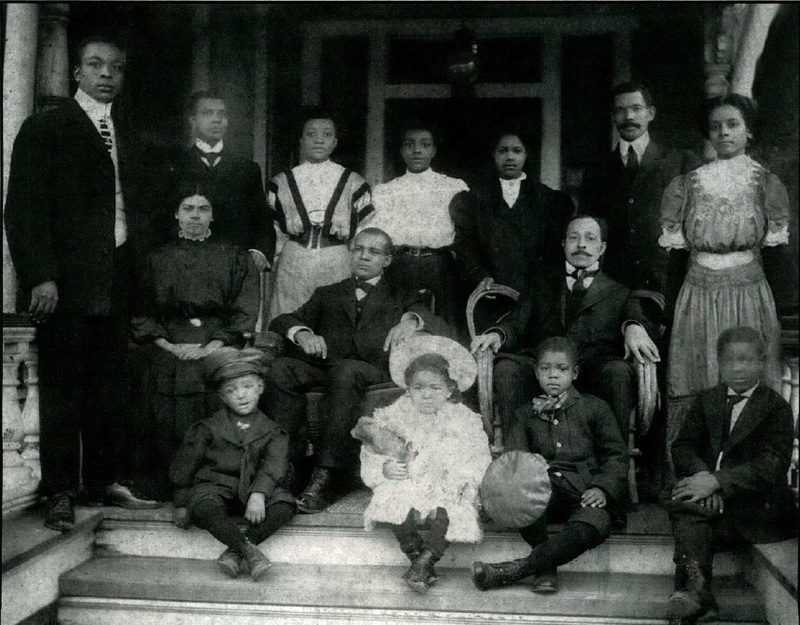 This handsome portrait captures members of the extended family of Samuel H. and Annie Washington Vick and appears to have been taken on the porch of their home at 622 East Green Street circa 1905. Vick is seated center left, looking off into the distance. The man and woman flanking him may be his parents, Daniel and Fannie Blount Vick. The boys are likely, from left, sons George White Vick (born 1902), Samuel H. Vick Jr. (1900), and Daniel L. Vick (1897). The little girl may be daughter Viola Vick, who was born after 1900 and died prior to the 1910 census. Eldest daughter Elba Louise Vick Valle (1893) may be the girl standing third from right. The men standing may be Samuel Vick’s brothers Ernest Linwood (1867), William Henry (1871), and James Oscar F. Vick (1872). The women standing are likely wives of the Vick brothers. Annie Vick appears to be the woman in the white blouse. Photograph courtesy of booklet commemorating the dedication in 2013 of the Samuel H. Vick Historic Marker, sponsored by Wilson County Historical Association. Corrections to the identification of members of the Vick family are welcomed. I wish I could go back in time and have had the opportunity to have known these people. This picture, is nothing less than, BREATH TAKING. I have read many articles, (thanks to you) about this family. Seeing them as a family unit, is awesome. I will archive it, as I have done so many of your other posts. It is a remarkable artifact indeed.